I love a tale where the young heroine can take care of herself. 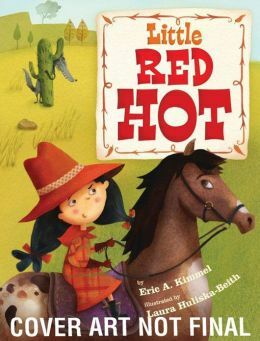 In this retelling of Little Red Riding Hood, Little Red Hot is a hot-pepper-loving, horse-riding, quiche-baking, big-bad-wolf-talking dynamo who figures out her own solutions. She is not perfect, but she figures out her mistakes and still finds a solution. Set in Texas, the story has the pace of a tall-tale, but one where we already know the story. We know Red will go to Grandma’s. We know there will be a Big Bad Wolf, or Señor Lobo. And we know everyone will come together at the end. What we didn’t know was how they do it in Texas. Suffice to say, the cuisine enjoyed by Little Red Hot, is not one that can be wolfed down. The pictures are as active as the character and give the feel of wide-open, cactus-filled landscape, where Little Red Hot seems both at home and in command. This will be an ideal read aloud for younger students. However, as a retelling, it also perfect for emerging second grade readers. If the students have heard the story of Little Red Riding Hood, they will be able to make accurate predictions about this story, aiding their reading comprehension, while still enjoying the differences. I would even recommend this fun book for third, fourth and even fifth grade readers who might be working on comparative literature themes. Fractured fairy tales provide plenty of room to compare and contrast the well-known plot with the new one. Kimmel’s other picture books offer more fairy tale hijinks and more chances to compare and contrast. Visit Eric A. Kimmel’s web page and see what he is up to now.